Picture from Bunsen7 : Just stand in that gap for a minute! Picture: Just stand in that gap for a minute! The series was mainly focused on the mountains of Ulster but included an episode on "na Sleibhte Chuailnge", the Cooley Mountains. 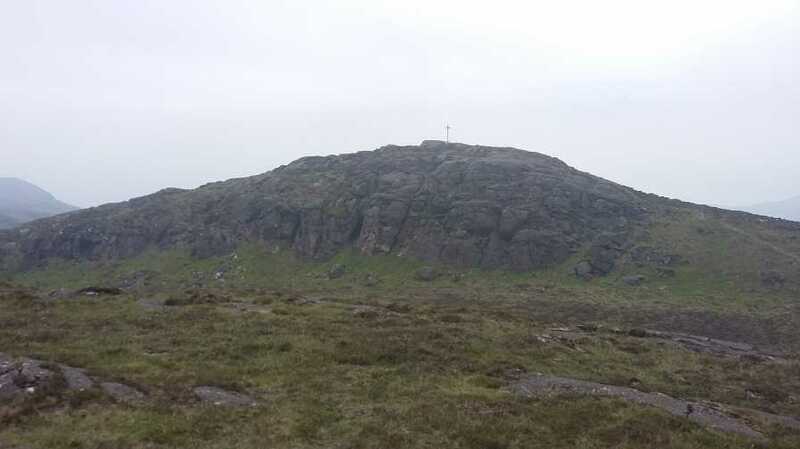 This episode obviously resonated with me as I learned some of the mythology of Maeve's Gap, “Bearna Mheabha” being anglicised as Barnavave, the gap which is visible when descending south-east off Slieve Foye. While I like the tales of a giant or even of Maeve’s army digging out the rocks – the “Tain Bo Cuailnge” epic sounds like a long read. A geologist will probably give a more scientific explanation of the gap arising from a fault line in the rock with granite between two humps of gabbro. More on the geology of the area can be found here: A geological field guide to Cooley, Gullion, Mourne and Slieve Croob by Sadhb Baxter. Though my primary objective was Slieve Foye and Barnavave just provided a slight detour on the descent, I recall thinking (like others have commented) that of itself Barnavave would make a very fine family walk from Carlingford (but more than enough to break a sweat from sea level) given that it can be accessed on a pretty low gradient track. There are fine views across the Lough from the trig pillar top, even when cloud has obscured Slieve Foye. I met three generations of the same family that had ascended a less taxing route from the west, the youngest daubing initials on the cross, which strangely seems to be the done thing.